Here is a new 'magazine style' Blogger XML template for free download. This template is called "Blue Steel" and features a unique layout for the front page to include extra widgets beneath the main post section (though if you prefer you can use this theme as a regular three column template). Read on for full instructions and to download this unique Blogger template for use in your own blog. There are many optional elements to this template. You may either use this as a magazine style theme (featuring more widgets than usual on the home page), or as a regular theme which contains only the main blog posts and two sidebars to the right. You can download this template for free using the link below. This is a Zip file which includes the XML template and instructions to upload this template to your blog. If you would like to utilize the full potential of this theme, you will need to change a few settings and make some small changes to the way you usually post. The ideal number of posts to display when using a magazine style theme is only one. Additional post excerpts will be visible from the "recent posts" widget which I will explain about soon. To ensure only one post displays on the front page, go to Settings>Formatting in your Blogger dashboard, and choose "Show 1 Posts" on the front page. This template includes code for you to show optional excerpts of posts on your front page. This customization was originally written by Ramani of Hackosphere, and is called "Selective Expandable Posts". Then save this setting. Now when you create a new post, you will clearly see where you should write your excerpts and the remainder of the post. For more detailed instructions about using this hack, please refer to this article. If you choose to use the magazine-style facilities for this template, you may also like to add the widget to display excerpts of your most recently written posts in the sidebar. This widget was originally written by Hans of Beautiful Beta, though I have modified this slightly to make this more suitable for the Blue Steel Blogger template. The widgets which appear under the post on the main page will only be visible on the main page. On post pages, these widgets will not appear, so be sure to include important widgets in your sidebar instead. If you would prefer to use Blue Steel as a simple template (IE: not utilize the magazine style elements), all you need to do is delete any widgets beneath the Blog Posts section. The template does not require any additional settings or adjustments to work as a regular template (although you may like to add your links to the navigation bar in the header section. See below for details about this). 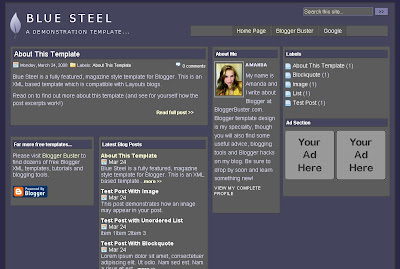 Certain features of the Blue Steel Blogger template are applicable to both "magazine" and "regular" options. This template comes with a pre-installed link list widget in the top right section of the header. When you upload this template to your blog, this link list will not contain any links at all. To add links to the navigation bar, go to Layout>Page Elements in your Blogger dashboard and click on the "edit" link for this link list. You can then add links to the main pages of your blog and these will appear in the navigation section. Right at the bottom of your blog template are some links which you can change to reflect the URLs of the main pages in your blog. Change the URLs highlighted in red to match those of your important post pages. You may download, customize and use this template however you choose. However, I do ask that the credits within the template code remain in place and that you do not redistribute this template without my consent.